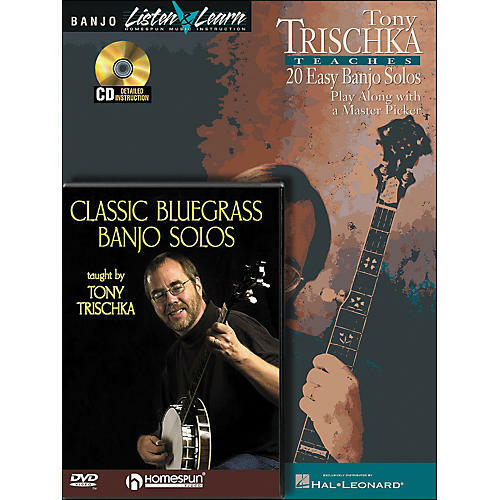 Includes the book/CD pack Tony Trischka Teaches 20 Easy Banjo Solos (00699056) and the DVD Classic Bluegrass Banjo Solos (00641567) in one money-saving pack. In the book/CD, Tony Trischka has personally chosen twenty traditional banjo solos that will teach you new ideas and add to your arsenal of licks and techniques. Tony performs each tune slowly, then up to speed, providing invaluable tips and explanations as he goes. By the time you have mastered all of these solos, you'll have acquired the basic skills necessary to play in the styles of Earl Scruggs, Don Reno, Sonny Osborne, and other bluegrass greats. In the DVD, Tony teaches eleven classic pieces. You'll learn them, note-for-note, just as they were played by some of the greatest players in the history of the instrument. By learning these tunes you'll not only expand your repertoire, but in the process will also become more flexible in your ability to mix up various rolls, play in several keys without a capo, and move more freely around the neck. Songs include: John Henry ¢ Sitting on Top of the World ¢ Gold Rush ¢ Bye Bye Blues ¢ Dixie Breakdown ¢ and more. A great value at $44.95!